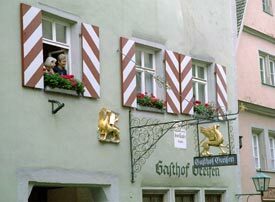 ABOVE: Tourists peer from a window at the Gasthof Goldener Greifen in Rothenburg ob der Tauber. With tourism being a major industry in Rothenburg ob der Tauber, there's no shortage of places to stay. The city's tourist office represents many local hotels, guesthouses, campgrounds, and vacation apartments. For a great selection of hotels at competitive rates, try the Rothenburg ob der Tauber listings of our main hotel partner in Germany, Booking.com. Rothenburg's most celebrated hotel occupies four connected 15th and 16th Century mansions on the Herrngasse, just off the Markplatz in the center of town. The traditionally furnished rooms vary from cozy singles to suites, and the hotel has a first-rate kitchen. This family-run boutique hotel is just outside the city walls. Its 27 rooms are decorated in a light, airy style that combines traditional and modern themes, and the "Franconian freestyle" restaurant is superb. We haven't stayed in the 650-year-old Altfrankische Weinstube, but its restaurant and wine bar are delightful, and the location in a medieval side street couldn't be more romantic. The reasonable rates for its six attractive B&B-style rooms (all with private bath) include a breakfast buffet.